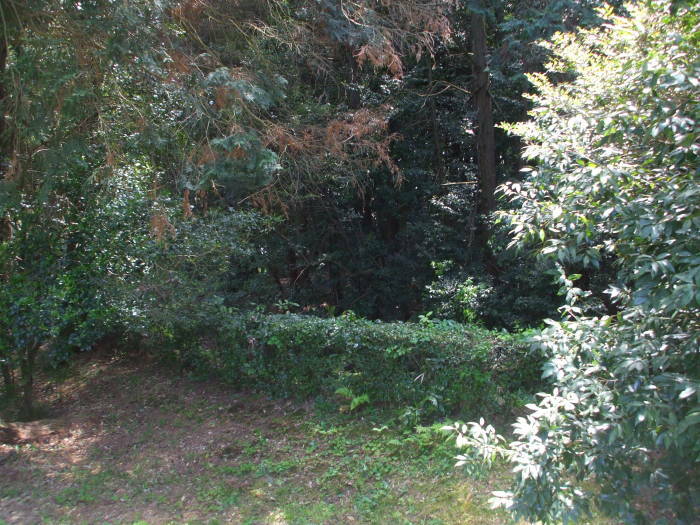 This kofun is one of the least to look at, but its purported inhabitant is fascinating. A woman who was Empress of Japan twice, who withstood multiple coup attempts, and who is best known today for her affair with a Buddhist monk. 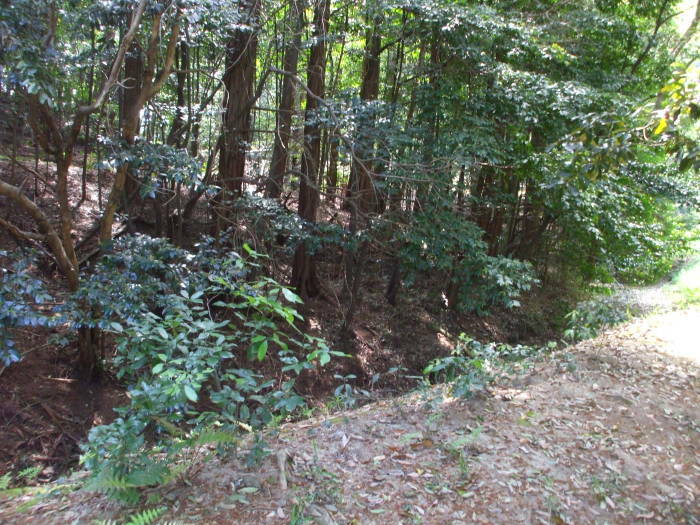 This kofun has a very different orientation, about ~75° versus the near north-south alignment of others in the area. Its location is 135.7874° N 34.6989° N. It is thought to have been built in the 4th century. 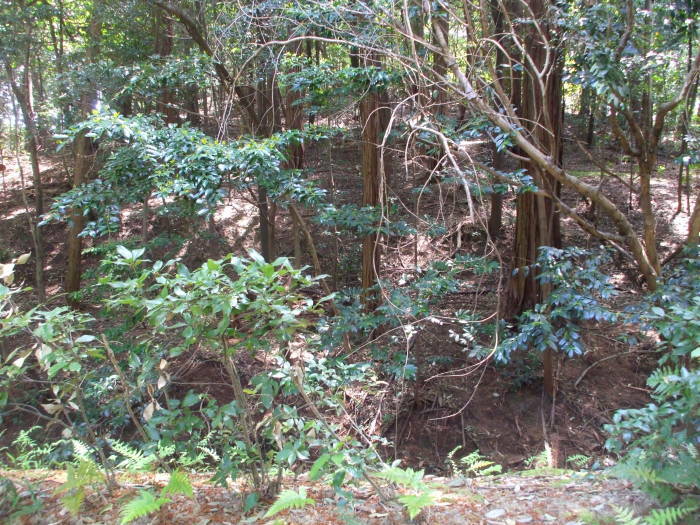 It's easy to find as its in the southwest corner of a tight kofun cluster. The moat remains as a dry ditch and berm around an oval mound. Trees have grown up through the moat and over the berm, leaving us without much to look at. Empress Kōken was the 46th and 48th monarch of Japan. She first reigned as Empress Kōken from 749 to 758. Then, as Empress Shōtoku from 765 to 770. She was the sixth of eight women to rule Japan as Empress Regent. She was born in 718, named Abe. Her father was Emperor Shōmu, the 45th Emperor. In the 25th year of his reign, in 749, Shōmu renounced his throne and passed it to his daughter Abe, who took the reignal name Kōken. A conspiracy failed to overthrow Kōken in 757. After ruling Japan for ten years, Empress Kōken abdicated and passed the throne to a cousin who became Emperor Junnin. In 764, the sixth year of Emperor Junnin's reign, he was deposed by his adoptive mother. Kōken reascended the throne in early 765, taking the new reignal name Shōtoku. Her reigns were certainly eventful. The aristocrat and stateman Tachibana no Naramaro planned a coup in 757. He and his group plotted to kill the Empress's chamberlain Fujiwara no Nakamaro. They would steal the imperial seal and ceremonial bells, make the Empress and Crown Prince resign, and install a prince of their choosing as Emperor. One of the conspirators was captured and tortured by caning, and he revealed all the details. The conspirators were all arrested. The Empress decreed that they should be exiled rather than executed, but the prisoners were all beaten with canes until they died. Then, in 764 Nakamaro tried to seize power. He and his wife and children were captured and killed. Kōken is most famous today for her affair with Dōkyō, a Buddhist monk. He had cured her of an illness in 761, and she gave him a place in her court. When she returned to the throne as Empress Shōtoku, she put Dōkyō in charge of both religious and civil matters. Oracles were consulted. One said that Dōkyō should be made Emperor. Another said that the throne should only go to people of the Imperial lineage. Dōkyō had the second oracle sent into exile. Dōkyō was exiled from Nara when the Empress died in 770. 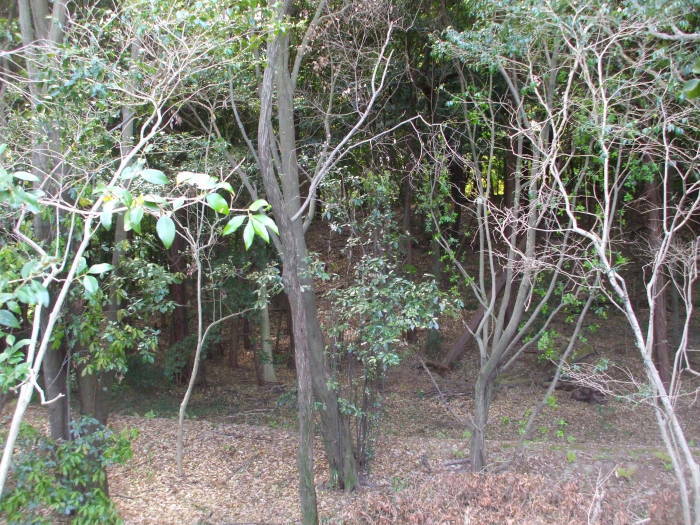 Of course, by 770 the kofun were no longer being built. The last ones were constructed in the early 600s. No one has any idea who is really in this one.